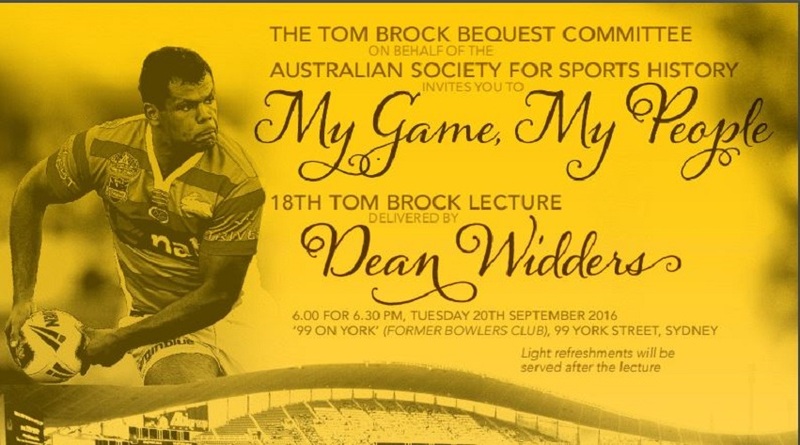 The Tom Brock Committee is delighted to announce that Dean Widders will deliver the XVIIIth Tom Brock Lecture with a presentation entitled: My Game, My People. Indigenous footballers have contributed more to rugby league than perhaps to any other Australian sport, and the game is a huge part of Indigenous communities. Participation in rugby league has brought many positive outcomes for Indigenous communities but there have also been some challenges along the way. Dean Widders will examine the place of rugby league in those communities through his own experience and look at the ways the game can affect a positive change. Dean Widders grew up in Armidale in country NSW where rugby league gave the Indigenous community a chance to make progress provided a strong voice of unity to the Indigenous community. As a player he spent nine years in first grade with the Roosters, Parramatta and South Sydney before finishing his career in England with Castleford. His passion for the game and for helping the Indigenous community has combined to provide him with great opportunities to learn more about the power of his culture. This power motivated him in his career on the field and still motivates him today in his career off the field where he works as an Indigenous leader in rugby league. These days he is employed educating Indigenous players about their responsibilities as role models to our communities, but also seeks to ensure they are armed with the skills and knowledge to have a strong positive voice to create a better Australia. to liase with individuals and institutions having an interest in the aims of the Society. Copyright © 2014 Australian Society for Sports History. All rights reserved.